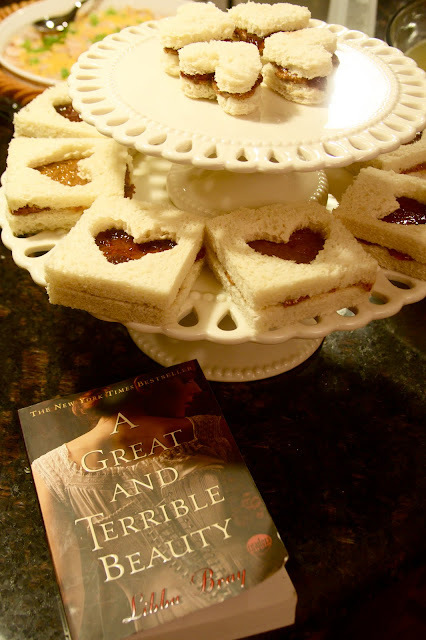 Our last book club for "A Great & Terrible Beauty" By: Libba Bray was a HUGE success!! We had 16 of you lovely ladies show up to discuss our magical, classical, Gothic book... and discuss we did! Karen and Laura did a wonderful job moderating and answering some of our questions and bringing intriguing conversation and questions to all of our minds. Thanks to everyone who helped with food and participated in the discussion! Bethany and I are giving our best Bang Gang look! I'm down with a big Book Klub group hug!! love ya gals!! that was such a fun book club. who knew there would be so much to talk about. i thought the book would be just a fun read. btw i loved the second book and am half way done with the third book. love them.